A major study of Americans has punched another hole in the official British government medical advice that there's no "safe level" of drinking. 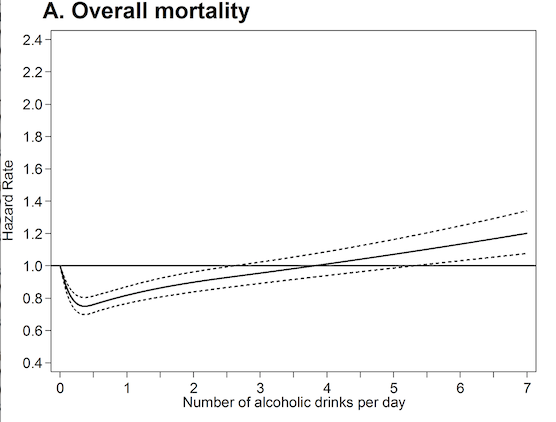 The cohort study of around 100,000 individuals found that infrequent drinkers and teetotallers had an increased risk of mortality. "Combined risk of cancer or death was lowest in light drinkers consuming less than 1 drink every day, rather than drinkers with higher intakes," researchers found. The study by Andrew Kunzmann of the Centre for Public Health at Queens University Belfast (et al), The association of lifetime alcohol use with mortality and cancer risk in older adults, casts doubt on the idea that even low alcohol consumption increases cancer risk. The idea that alcohol should be shunned entirely was promoted by the UK's "Chief Medical Officer" Dame Sally Hawkins in 2016 – but her headline-grabbing statements were criticised by leading statisticians. More than 80 previous studies have found that risk follows a J-Curve, where moderate consumption rewards drinkers with a lower risk than teetotallers or heavy drinkers. The Kunzmann study confirms this. The work advances previous knowledge by addressing the criticism that earlier studies only took a snapshot, and separated healthy and unhealthy drinkers. This work assesses risk over an individual's lifetime. Optimistically, they recommend official public health guidelines to make use of the evidence. "These results could help inform future US guidelines, which currently recommend less than 2 drinks per day for men and less than 1 drink per day for women," they note.